Here’s another fifteen minutes of big band music by Raymond Scott. Our show was originally heard September 8, 1944 on CBS and distributed as program 146 in the series for the Armed Forces Radio Network. The first song is “Amore”. I think this is a previously uncirculated episode. 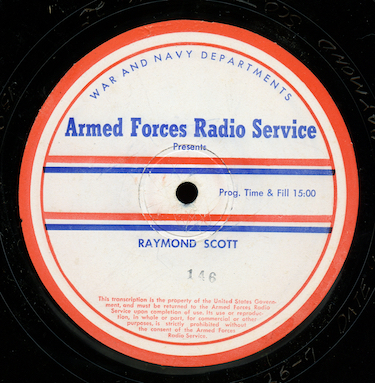 The program was transferred direct to digital from an original vinyl Armed Forces Radio Service transcription; the date is from the disc matrix.